Charles Dagand used to be one half of the dynamic l’Octavin team but they went their separate ways. Now, Charles is back making his own wines and has agreed to supply us for distribution in Australia. 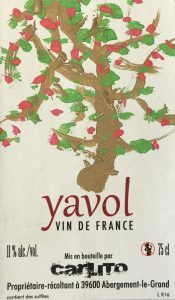 We are delighted to be receiving small quantities of his Charpindo and Yavol that we tried on our recent trip to the Jura. This is a delightful white wine made from Chardonnay and Pinot Noir from vineyards near the village of Abergement-le-Grand which lies just a few kilometres to the west of the main town of Arbois. Charles is certainly demonstrating his skills in both tending the vines and making the wine. The Pinot Noir (which comprises one third of the blend) is pressed quickly to ensure that none of the colur is leached from the skins so that a white wine results. The Chardonnay is pressed separately. The fermentation for this wine was very slow due to Charles’ very cold cellar. It lasted right through winter! After the two wines had fermented separately they were blended and matured until bottling. We look forward to this wine arriving. When we tried it in the Jura in February it was looking very good and is already gracing the wine lists of some great restaurants including Restaurant Geist in Copenhagen. We recently tried a bottle that we had “suitcased” back to Australia and it was stunning! Yavol has a more complicated story than the Charpindo. 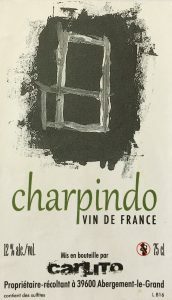 It is a blend of all of the authorised grape varieties of the Jura, namely Chardonnay, Savagnin, Pinot Noir, Trousseau and Ploussard picked from a very old parcel of vines where the varieties are co-planted (this old vineyard has the vines planted randomly which means there might be Pinot Noir vines planted next to a Savagnin vine). The grapes were pressed together and then macerated on skins for about six weeks. The juice was then transferred to old barrels where it was left to ferment over winter. The result is a delicious wine which has an interesting texture from the combination of red and white grapes and a complex and compelling flavour derived from the interaction of the different grape varieties. And, at only 11% alcohol it can be enjoyed at any time of the day, including breakfast!